Lot 10 1285 Ketch Harbour Road, Ketch Harbour (MLS® 201902756): Looking for that dream home, look no further! This wonderful home design offers a fabulous layout great for that growing family. With 3 bedrooms up and 1 down, open concept kitchen/dining area, large rec room on lower level with convenient 3 piece bath and walkout to your private yard. Hardwood on stairs and a ductless heat pump are inc. along with being energy efficient. You just need to finalize the touches to make it your own. 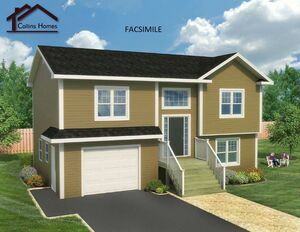 Convenient built-in double garage and large storage area make this perfect for any family dynamics. Wonderful family & peaceful location, only minutes to downtown yet far enough to give that private and tranquil setting. Peace of mind for years to come. Built by an award winning builder, this turn-key home package also qualifies for first time buyer new home rebates.